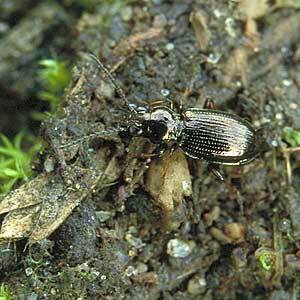 Description: A small (3-4.5mm) brassy-black ground beetle. Very common on open ground, particularly in gardens and on arable land. World Distribution: A Eurasian Wide-temperate species (65) species found across Europe to eastern Siberia and introduced to N. America. Irish Status: Widespread and locally abundant, but scarce in the west. Widely distributed in Britain and the most frequently recorded Bembidion sp. according to Luff (1998). Ecology: Fairly eurytopic in Ireland, but showing a preference for arable land and drier habitats near the east coast. Also reported widely from pitfall traps on drier types of Calluna heath.